The first-ever FDA compliant PCF paper cups. Made from a minimum of 90% plant-based renewable resources and a minimum of 10% post-consumer recycled fiber. 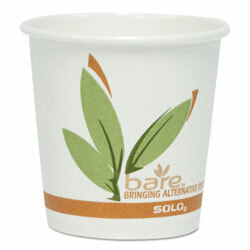 Features environmental Bare® by Solo® design and common lid fit. Cup Type: Hot; Capacity (Volume): 10 oz; Material(s): Poly-Coated Paper; For Use With: SOLO® LB3101. INNER PACKAGING: 1 Pack Per Case. 50 Cups per Pack. 10 oz. Paper Cups from Solo Inc.! 29 In Stock today.